The bracelet business was started in 2011. Sarah Ward, a teenaged member of a team that traveled to Malawi in 2011, purchased a bracelet from a vendor at Lake Malawi. She then thought of all the people she knew in the states that would like them, too. She asked if the women at KOCM could be taught how to make the bracelets and if it would work for the bracelets to be mailed to the US and sold there. After some brainstorming, it was decided to try this business idea. One hundred dollars was initially donated to purchase supplies, pay a teacher so the women could learn how to make the bracelets and for mailing costs. The women liked the idea of having their own business. They chose someone to be keep track of the supplies and records. In 2012, the first supply of bracelets was mailed to the US. In 2013, we have 3 styles of bracelets for an $8 donation. 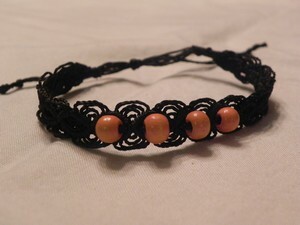 From that donation, $5 is used for supplies and mailing costs, $1 goes to the woman that made the bracelet and $2 goes to support scholarships for high school students. Click here to view the newest bracelets.